"What is the meaning of October hockey...?" The Penguins finished out the first month of the NHL regular season with a record of 7-5-1. Not too shabby but coming off yet another set of back to back games which showcased another abysmal performance and overall throttling, this one coming from the Winnipeg Jets, it's becoming clear that "Stanley Cup Hangover" is the least of whatever problem there may be. What are the problems? Well....it's not all that simple. Maybe it's goaltending? A solid theory in itself. You have the young phenom Matt Murray taking the number one slot but, as of right now, there is essentially no one that is even close to being what the Penguins need a back up goalie to be. And the need for a good back up is severe.The goal tending, specifically in back-to-back game situations, hasn't exactly been the greatest. When you have as many back-to-back games as the Penguins have, a solid back up is a necessity, especially coming off a game that saw your starting goalie take a shot to the head. No one is saying that back ups have to win every game they play in, but it would help, in this case, if they actually won one to start with. The Penguins will have to address the (new) goalie situation and sooner rather than later. With 15 more sets of back to backs as well as the remainder of the regular season, giving up to many losses could change the landscape of the post season. Maybe it's the lines? It was underestimated on how much of an impact losing the likes of Matt Cullen, Chris Kunitz and Nick Bonino would be. While the Penguins have been able to fill the open spots on the ice, the roles and characteristics of those spots have not. There is no seasoned veteran or "father figure" to "tell it like it is". There is no hard nosed grinder that consistently wins puck battles and creates scoring chances. There is no goofball that keeps the energy positive when times are tough. What there is is a bunch of new guys (Greg McKegg, Matt Hunwick, Riley Sheahan) who are hoping a change of scenery does for them what it did for Justin Schultz. What there is is a new-age enforcer (Ryan Reaves) who barely gets to play at all even though his game has vastly improved. What there is is a struggling bottom six that has no solid, trustworthy center to carry them and superstars who would rather play pass the puck than shoot them at the net. Maybe it's ...maybe everyone needs to just calm down. Wait what? Yes, maybe everyone, needs to just step back and take a breath. Are things going exactly according to plan? Probably not. General Manager Jim Rutherford even made the comment recently of not liking the way things look right now. Could things be a lot worse? Absolutely...just look at the Rangers or, even worse, the Coyotes. Have the Penguins struggled early in the season before and come out on top? That is a loud and resounding yes. Is it too early to panic? 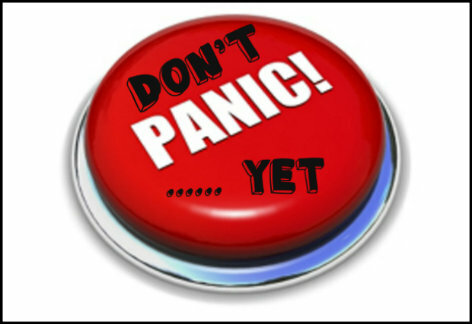 Yeah, it is, but it is not to early to show a little concern. As far as the Penguins are concerned, if recent seasons are any indication, things have a way of working themselves out. 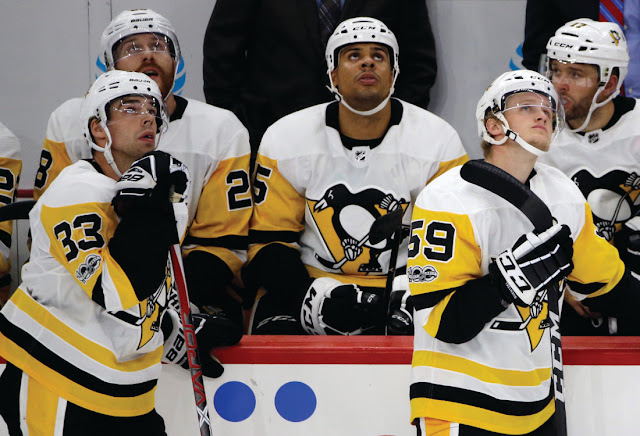 The Penguins are a team once again trying to figure themselves out and this time around, it may take a little longer than some would like. Let the organization do what it may need to do before going full on with slamming our fists into the red panic button. There are options available and you can be sure Penguins management knows that. They also know what their team is capable of and that there is some time to work on adjustments. Things were bound to take a little bit of a backslide and that is something we all just have to deal with right now.